At least that’s what the politicians want you to believe. The reality is different. Small business is under attack from every quarter. Government policies favor large banks and large multinational businesses. Credit is tight and the banks favor the larger borrowers. Increased regulations stifle innovation and protect large incumbents that can afford teams of lawyers and lobbyists. What’s the little guy to do? Waiting for the politicians to change the system is wishful thinking. Smart business people find ways to prosper in every environment. 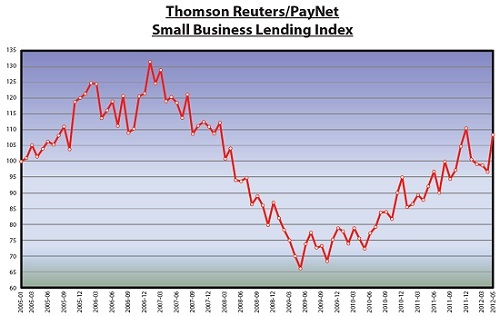 And the current environment is not great for small firms. The Federal Reserve Senior Loan Officer survey has recently confirmed what we have suspected for some time: banks have been more generous in easing underwriting requirements for larger companies than they have been for smaller companies. Paynet, which maintains data on 17 million small business loans, reports that lending conditions for small firms have deteriorated in recent months after two years of bounce back from the 2009 bottom. For additional details go to the full article on Capital Matters. If anyone doubts we are moving to more monetary accommodation, take a look at the excerpt below from last night’s U.S. Financial Data release from the St. Louis Fed. The lower right hand corner reflects the most recent trends. In June, we posted an article indicating a seeming correlation between the trend in direction and magnitude of U.S. M2 growth and U.S. economic activity. The decline in the M2 growth rate has now turned, and is headed up again, as you can see below, but the turn is not as dramatic as the growth in the Monetary Base. We’ve previously stated our concern that the U.S. could be heading into a period of rapidly increasing inflation, similar to that experienced in the early 1970s that led to many years of stagflation, only ending with Mr. Volcker’s monetary castor oil. We’ve got all the ingredients, including this summer’s rapid runup in commodity prices. The past twelve month the GDP price deflator has dropped from 2.4% to 1.9% on an annual basis, averaging a bit above the Fed’s 2% target. 2-3% is in the range where the 1970’s inflation began to take off. Yet, we’re in a period where many, if not most, observers have been talking recession and increased likelihood of deflation. Real inflation will come as a black swan for many, with significant implications for both fixed income and equity markets. Permalink | | Comments Off on QE Anyone?